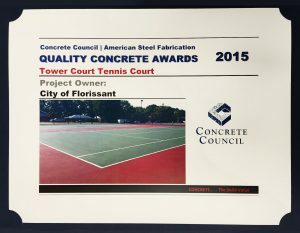 A recent project of ours, Tower Court Tennis Courts, was awarded a Quality Concrete Award for 2015 by the Concrete Council of St. Louis. The courts are located in the City of Florissant just north of St. Louis. Vee-Jay Cement installed the post tensioned concrete slab and was the lead on the project. Other members of the Concrete Council in participation were Kienstra Ready-Mix for concrete supply and Geotechnology for quality control. Our role included the preparation and installation of the acrylic color system to the courts. Criteria for this award includes procedure, special or challenging situations, special components of the project, and the role/benefit of using concrete over another surface for this project. McConnell & Associates is pleased to be part of this award winning team.